Though the new year has started so tragically for France and the Western world, I still wish you, your friends and family and all members of your organisation the best for the new year! Please now that a large part of the Dutch society stand behind the French! I sent you this message to give you an update on our club. We officially started oktober 1st. Since then we have recruted 13 members in total. One member lives in Switzerland and one in Belgium, the rest in the Netherlands. Together we account for 13 Epagneul de Saint-Usuges. 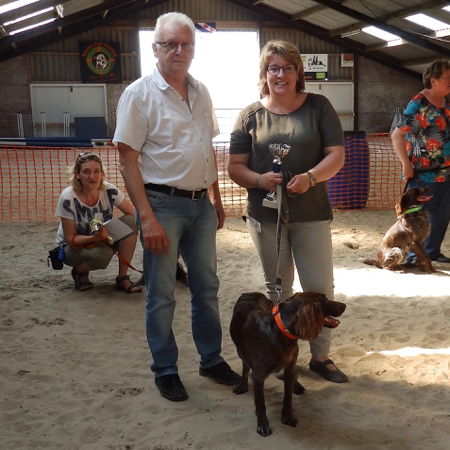 In oktober, 6 Saint-Usuges attended a walk/hike of the Dutch society of Epagneul Francais (NCEF), making a lot of people (hunters and experienced dog-owners) enthousiastic for our beautiful breed. 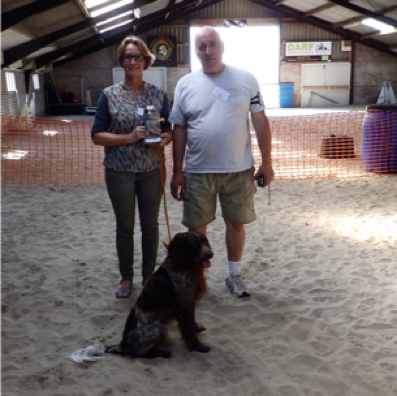 In november I attended a clubmatch of the Dutch society of Epagneul Blue de Picardi, Picard and Pont-Audemer (NVEBPP) with our pup Ibbe. The judge was very impressed by this dog and told everybody a lot about this dog, it's herritage and it's working-properties. Together with the presidents of both societies we have decided to form an alliance, working together to organise activities (workshops, walks, festivities) and exchange knowledge and contacts. This 'alliance of French spaniels' will work together to keep these breeds in the spotlights and to save them as beautiful and all-round hunting dogs. Last week we published our first newsletter. 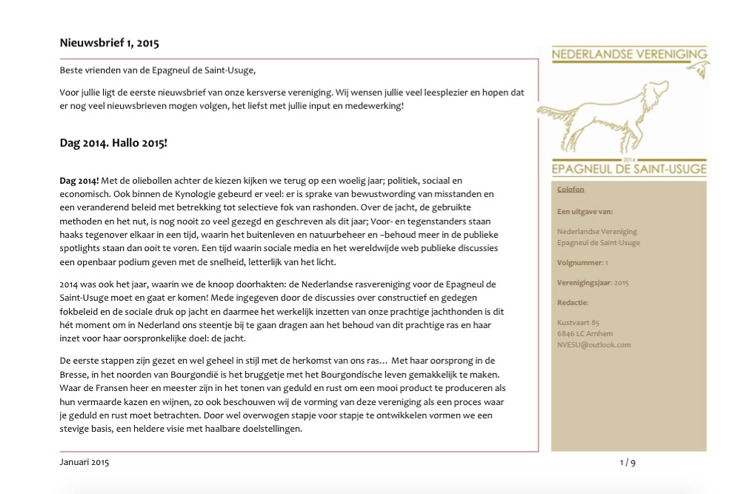 I have attached it to this mail, though it is all in Dutch, just to give you an idea. We start in March with a hike. We plan at least one hike in autumn. We plan a summer meeting with activities and a festive element. 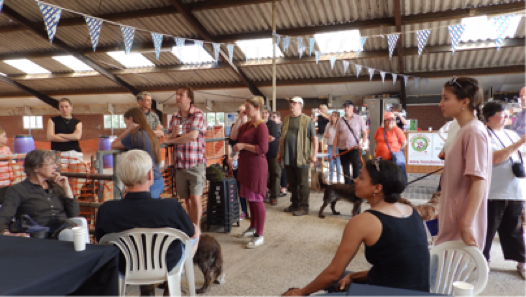 We have told our members that at least a confirmation in France (or Germany) would be good for our breed and good to show our commitment internationally. If people are interested to attent, the Dutch club will coordinate. Organisation impeccable, un vrai travail de "pro"